So, a couple of weeks ago, our computer decided to die on us. At first I thought the worst: Fried hard drive. It wasn't that bad, but after a few hundos to fix the issue we now have a 500GB external hard drive that houses all of our files, pictures and my freelancing stories from the last 7 years. We are in the process of shopping for a new laptop while borrowing Sharon's old one. So we'll get some more photos uploaded as soon as I get the time and energy to hook up our printer/scanner to the new laptop. 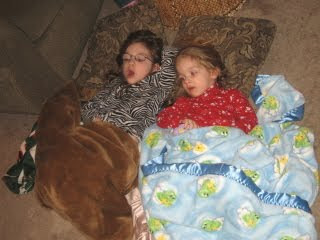 We've been talking about it for some time now, about moving Delaney and Adelyn to big girl beds. Saturday was the day and the girls loved it immediately. Brittany had an old bed that we hadn't used since we were married, but it was only about a year old when we moved into the house in 2002. So we've had it wrapped up in the firehouse (our garage) for the last handful of years until yesterday. 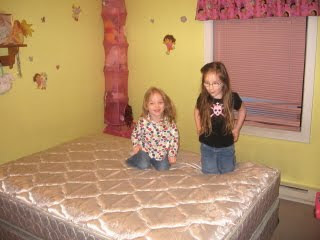 The girls bouncing on Delaney's new bed. Blue Grandma gave Delaney a new comforter for Christmas and is in the process of making matching curtains for her as well. My girls happy as can be. Adelyn tucked herself in with Delaney last night during story time. We were going to transition Adelyn to Delaney's old toddler bed seeing as Delaney had a little bit of a difficult time with that about three years ago. We put the bed in Adelyn's room just to get her used to it but within about three seconds, she was calling it her own. This is Jon. I've always wanted to head up in the hills on a snowmobile. Everyone who's worth a dang in Cle Elum has a few snowmobiles at their disposal, but the Giaudrone family had more than enough for me AND they can ride right from their driveway. We've been talking about me riding with them for a while now and I finally jumped at the chance to ride. This is Eric and I right before we left, I'm the good looking one on the left with the helmet. 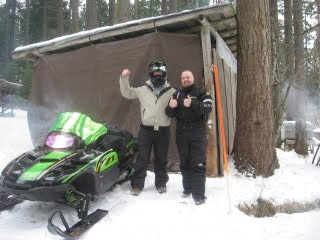 Next to me was my sled for the day, an Arctic Cat I named "Pollywog". It used to be Eric's wife's Cindy's sled, but she bumped up to a new one that has as much power as a rocket ship. Seriously. I named my sled Pollywog only because it had a butterfly sticker on the windshield. I thought it made me feel pretty. Sometimes we find Adelyn doing the weirdest things. Some are prompted by her big sister, Delaney, other times it's her normal demeanor. 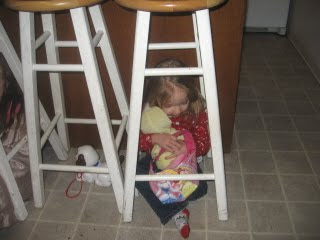 Delaney and Adelyn sometimes smash each other underneath the bar stools in the kitchen. I think it's when they're "at school" or when their "driving the car". Either way, it's cute. Delaney used to do it at this age and now it's Adelyn's turn: Wearing Mommy and Daddy's shoes. These are Mommy's boots. Addy looks a lot like Delaney here, I think. It's pajama times, so obviously that means wear Mommy's slippers! The girls are such great road trippers. 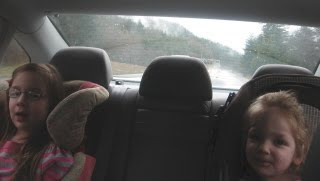 Not a very good photo here (I was driving at the time) but the girls were singing together in the back seat. We were on our way to the Guddat Family Christmas last Saturday in Maple Valley. Grandpa Jeff sat with the girls at the kids table for Christmas brunch. I thought it was a great picture. The girls absolutely adore their Grandpa and the feeling is quite mutual. I didn't get a photo of it, but the girls were playing tea party with Grandma Sharon. Pretty much every visit, Grandma is on the floor coloring or playing tea party. This is Jon. We've received three separate days of solid snowfall in the last four days. It's awesome. I like to drive in it, the girls like to play in it. 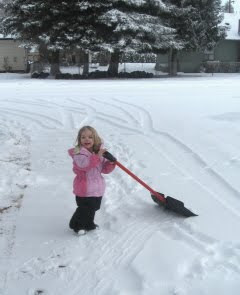 Adelyn gave it her best shot in clearing the driveway. The girls then decided to sit and play. Adelyn under close supervision by her friend, next door neighbor, Rusty. This is Jon. Nothing specific here, just some cute pics. Sometimes we'll find the girls at each other's throats, many times we'll find them connected at the hip, as though they can't do anything without the other. We've been getting some decent amounts of snow over the last week. It's been great. Two little bundles of joy. When we moved out our Christmas tree the other day, Delaney got out her "toy" vacuum to help me and my real vacuum.